We find ourselves in interesting times. We're facing huge socio-economic challenges while at the same time we need to look ahead and design a society that meets our future needs. For this, we need a renewed understanding of craftsmanship in relation to the design and production principles of the 21st century. 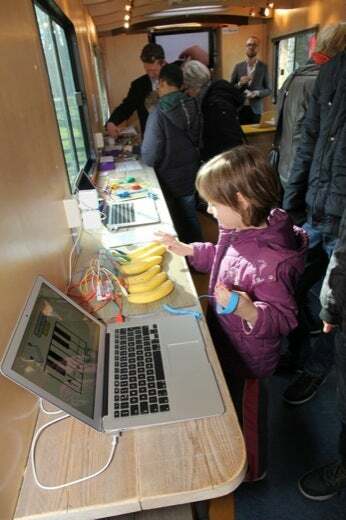 In the province of Fryslân, the northern part of the Netherlands, we're using a mobile lab facility called FryskLab (a former library bus) to bring making and 21st century skills to primary and secondary education. We're also hoping to find solutions for local socio-economic challenges. FryskLab is Europe's first mobile Library-powered fab lab. We have a team with a very diverse background. FryskLab is initiated by a public library service organization (Bibliotheekservice Fryslân, the place where I work), in close collaboration with team members with a scientific-, educational- and technological background. Two—including me—are on the board of the FabLab Benelux Foundation. 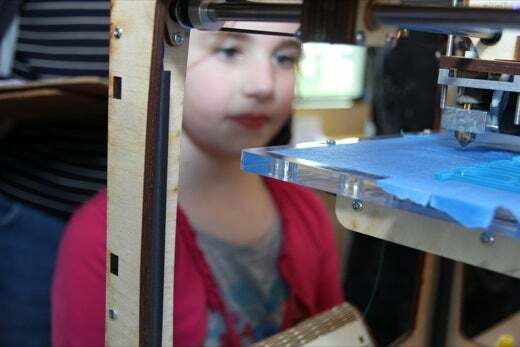 We started the project in November 2012, after noticing that, especially in the US, libraries started to see the potential of working together with FabLabs and makerspaces or creating their own. Me and some colleagues received space and time to see if we could bring this development to the rural province of Fryslân. FryskLab uses the FabLab environment to bring 21st century skills to primary and secondary education. We tackle specific local challenges with our dedicated educational program. For instance, the FryskLab Elements course focuses on digital fabrication in relation to water technology, sustainable energy, and new craftmanship: themes that are locally important. At the moment we're in talks with a large number of educational institutions, from primary schools to university level, to realize three life-long digital fabrication learning courses based on the aforementioned themes. This should result in a high potential of skilled young talents for local companies, which will benefit the local economy that is currently lacking in qualified staff. This dedicated local focus is necessary to realize a sustainable fab lab. Often we see examples of libraries setting up labs which are little more than a display for 3D printers and other similar machines. That's perfectly fine, but we think the potential for digital fabrication in relation to libraries is much higher than that. To quote David Lankes, "The mission of librarians is to improve society through facilitating knowledge creation in their communities." That is the reason we decided to connect to the fab lab community instead of becoming a regular maker space or media lab. Fab lab is a worldwide hub of open design spaces and facilities where you can make (almost) anything. Fab labs connect digital craftsmanship with open source machines for digital fabrication. The underlying open design principles make it possible to easily share and reuse designs and blueprints over the internet. This turns fab labs into a networked structure for global collaborative design and production, for the sharing of knowledge and economic growth. In our educational program students learn use how to use these tools for digital fabrication and open design principles, for the purposes of coming up with solutions for local issues. FryskLab received its official fab lab status a couple of months ago and we got quite some attention, also internationally. In April we will talk about our project in Roskilde, Denmark, at the Make of Die! conference, organized by Centralbibliothek. We'll be Skyping in to the Computers in Libraries conference for the Makerspace Info Blitz. In May, we're driving to Aarhus, Denmark to be part of the Mini Maker Faire, and we're hosting sessions especially for library colleagues. Besides FryskLab Elements, we're also collaborating with the Mozillarian community, a group of librarians and technologists who explore the intersection between the Mozilla community and the library world. We got in touch with them through Wim Benes, a Dutch and Frisian translator for Mozilla products. He visited FryskLab and mentioned the beautiful Webmaker project. We're very interested in incorporating Webmaker in our educational offerings. Their Web Literacy Map, a map of competencies and skills that Mozilla and its community of stakeholders believe are important in reading, writing and participating on the web, is extremely interesting from a library standpoint, We want to make this available in Dutch and we're thinking about how to set it up. We also want to give something back to the fab lab community, so we'll develop a Linked Open Data framework and Knowledge Base to make fab lab projects available for interested users. The starting point is the notion that a fab lab as a physical makerspace is always connected to the fab lab as an information space. We're working with Dr. Peter Troxler of the University of Rotterdam, semantic technologist Roland Cornelissen of MetaMatter, and another small Dutch FabLab, Rotslab. "FabLab as makerspace is always connected to FabLab as information space." We are also developing a program, called Fab the Library!, to make it easier for libraries to incorporate a fab lab. The pilot for Fab the Library! will start in April this year and we're also thinking to making it available in non-Dutch countries. For both projects we received funding from two library-oriented institutions: Pica Foundation and The Netherlands Institute for Public Libraries. Besides funding, we're working hard on a sustainable business model. To participate in our program, schools pay for using educational material and working in the mobile fab lab. Furthermore, we are collaborating with local companies in challenges: students find solutions for their company-defined problems and try to solve them using open design principles. In the long run, we expect companies to finance parts of our program. In return, they can expect to find talented, motivated young people who are interested and qualified to work for them. Finding the connection with the already present local economic infrastructure and stimulating bottom-up innovation is our key proposition. Personally,it's the most exciting project I've ever worked on and it's far from over. To be able to do this as a librarian is extremely rewarding and I would like to see it becoming a global movement. Originally posted on Medium. Reposted under Creative Commons. This is so interesting keep it on. Myself I was thinking about that many year ago, initiating digital library especially in rural area was my interest but first many challenges on how I can go about. Now I am a teacher in public school, my school is in rural area but we are accessing electrical power which means it is easy to initiate this project but the challenge is how to fund this project. when I was searching to see how other people in different area are doing this I came across your blog, your inspired me so much. But I need your assistance to fulfill this dreams of helping people in rural areas to access information and develop their potential career.